Since the 13th Century, Poland's most persistent and consistent foes were the Teutonic Knights in the North and the Mongol Horde, later the Tatars, in the Southeast. The contrast between the two types of enemies produced a dilemma for the Polish army, since a force suitable to combat one enemy was inadequate against the other. Infantry and artillery, needed to evict the technologically advanced Teutonic Knights from Prussian castles, could hardly be used against the elusive Tatar cavalry in the wide-open plains of the Ukraine. Conversely, the cavalry required to catch the Tatars was quite useless in a siege. 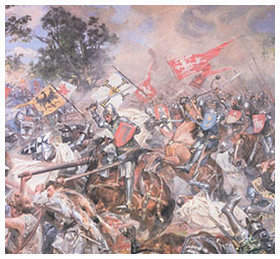 Naturally, the Poles developed both types of arm, but because of the greater vulnerability of the open Eastern borders and the decline of the power of the Knights at the beginning of this period, the Poles cavalry arm tended to be emphasised and the infantry were usually restricted to sieges. At the beginning of this period the Polish army was one with a very successful recent past (e.g. Grunwald, 1410; Swieta pod Wilkomierz, 1435). It was still a medieval, feudal army based around the heavily armoured knight, although using some techniques learnt from the splendid Mongol army. However, this glorious era ended with the knights taking on political aspirations. In the Thirteen Years War, instead of fighting the enemy the knights first argued amongst themselves and then, before they would do battle, demanded certain rights from the King. Worse still, although the King was forced to accept their demands, the army was unable to regain its lost discipline and was defeated at the hands of a small Teutonic force (Chojnice, 1454). The Poles finally defeated the Teutonic Knights in 1466, but with a mercenary not a feudal, force. From 1458 towns were required to provide infantry and artillery a well as cavalry. In times of greatest danger the peasants were also called up and served on foot. The maximum numbers of good cavalry at this time were said to be 50,000 for Poland and 20,000 for Lithuania, although these numbers were never actually used. In the 1490's a current defence force (obrona potoczna) was formed and used to defend Red Ruthenia from Tatar raids. It was around 2,000 strong. Since Medieval times the basic Polish battle formation was the Old Polish Formation (Stare Urzadzenie Polskie), as used at Grunwald and shown in Fig. 1. It was used very flexibly, the two centre hufs (regiments) were composed of heavy cavalry and were well spaced to allow lots of room to manoeuvre. The wings were generally composed of lighter troops, with the reserve consisting of the best troops. An important aspect of this formation was its ability to turn and meet flank or rear attacks. By the beginning of the 16th Century the poor discipline of the feudal forces had led to the army being based solely on mercenaries although in times of extreme danger a general call-up of the feudal forces would still occur. The method of raising the mercenary units (called rota) was by letters of summons, these were sent to the rota commander and set out the unit's type, size, equipment and period of employment. The rota commander would then gather nobles, who would bring with them three or four retainers. The nobleman and his retainers formed a poczet which was the smallest unit in the army. It was the nobleman's responsibility to arm, equip, pay and supply the poczet for which he was reimbursed by the state. Rota sizes varied a great deal but were usually between 50 and 100 men and they were the largest organisational units in the army. Hufs were purely tactical units used on the battlefield. The army was raised by the Sejm (Polish Parliament) voting increased taxes on the nobility. The problem was that the Sejm consisted of nobles and they were very loath to tax themselves, except for very good reasons.